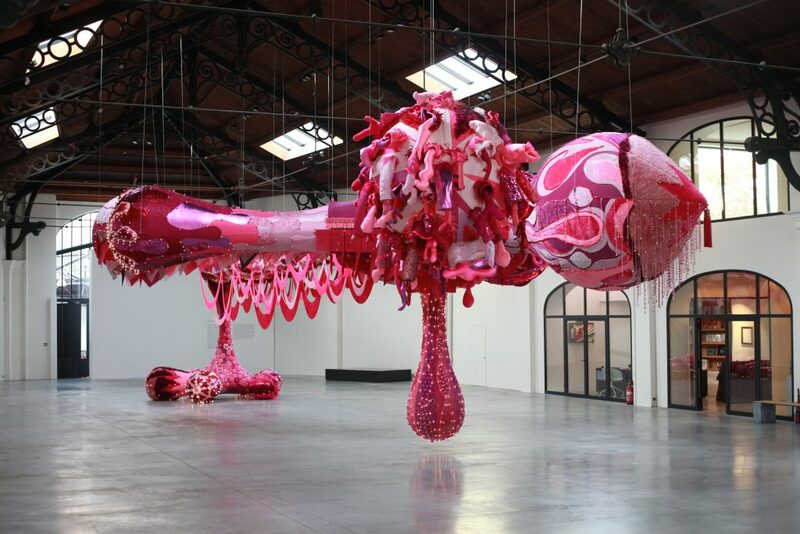 For the fourth exhibition since its opening, La Patinoire Royale gets into the heart of the extroverted and baroque world of sculptor Joana Vasconcelos. 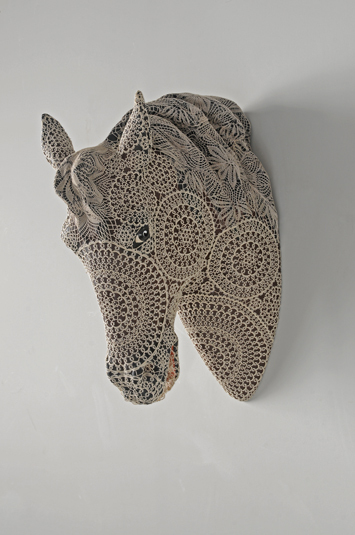 This huge retrospective, the first ever organized in Belgium, brings face to face the vastness of the gallery’s space and the work of this protean artist. 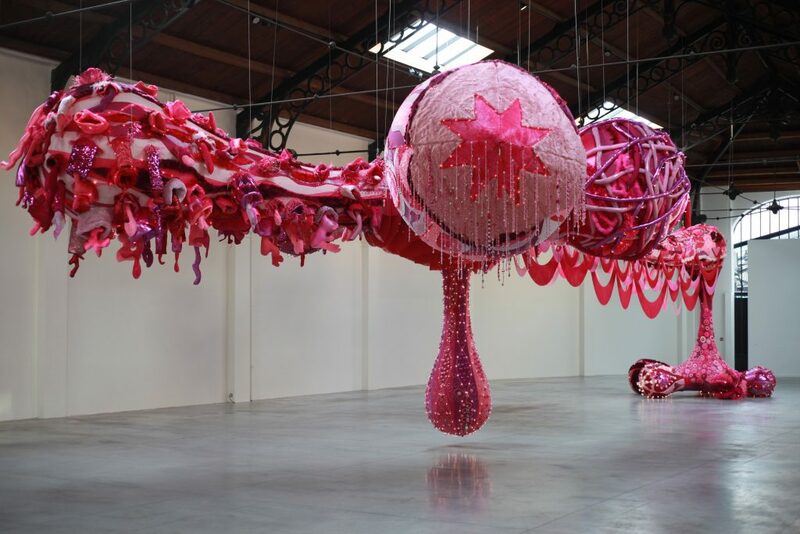 Joana Vasconcelos, a Portuguese born in France, was the first woman – and still the only one – invited in Versailles in 2012 for a magical and festive exhibition. The youngest artist ever presented in Versailles, now moves into all spaces of La Patinoire in Brussels : beneath the nave’s wooden framework, under the gallery’s glass roof, as well as the gallery’s lab and additional spaces on the ground and first floors. 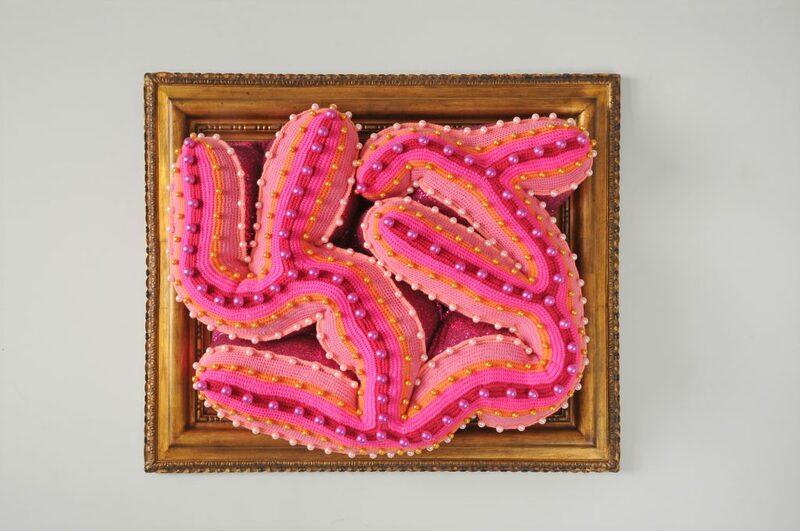 Inspired by a world full of octopuses and huge sprawling creatures from Jules Vernes Twenty Thousand Leagues Under the Sea, this exhibition submerges us into the fairyland of colours, forms, and matters of the artist. 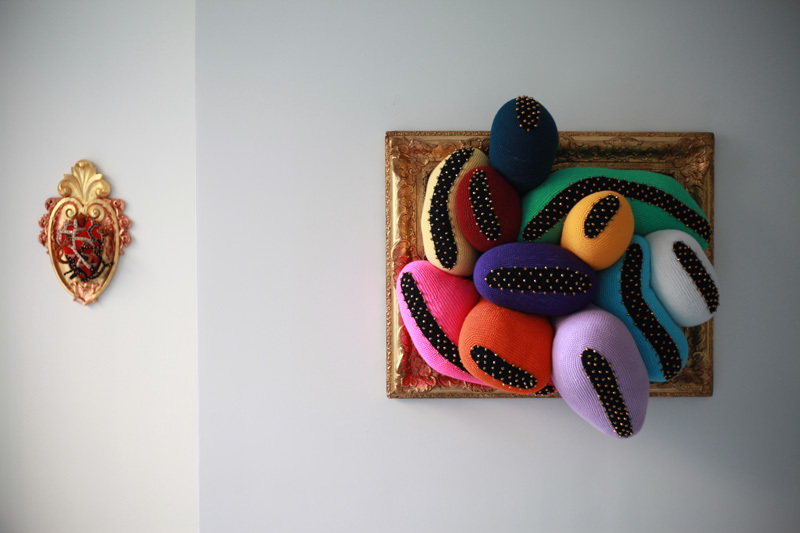 Juggling with embroideries, laces, crochet-works, patchworks and sparkles directly derived from the Applied Arts and from the traditional Portuguese practice of needlework, Joana Vasconcelos invites the audience to a generous banquet of sculptures and painted textiles, without moderation from the gargantuan artistic avarice which characterizes her artwork. If the world of fashion designers working for famous houses of haute couture has been intentionally qualified as a “smile industry” thanks to its ability to bring light, creativity and joy to artwork to which it gives brilliance then it’s also with a broad smile that we broach this exhibition, paying tribute to such a feminine creation, personified into monumental works, as well into more intimate productions. 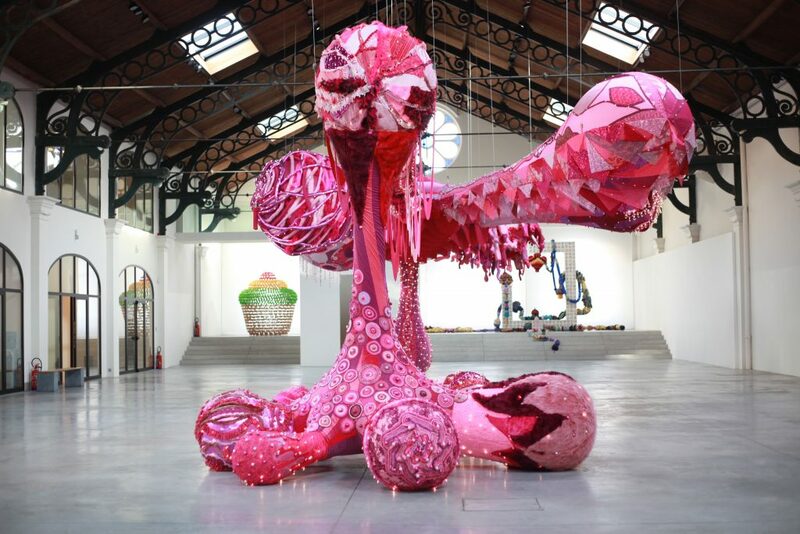 Joana Vasconcelos has transformed this needle technique into a pure artistic expression, sometimes monumental, where lavishness meets quirkiness, in an approach not at all refuting eccentricity or excess, without foregoing delicacy and excellence. 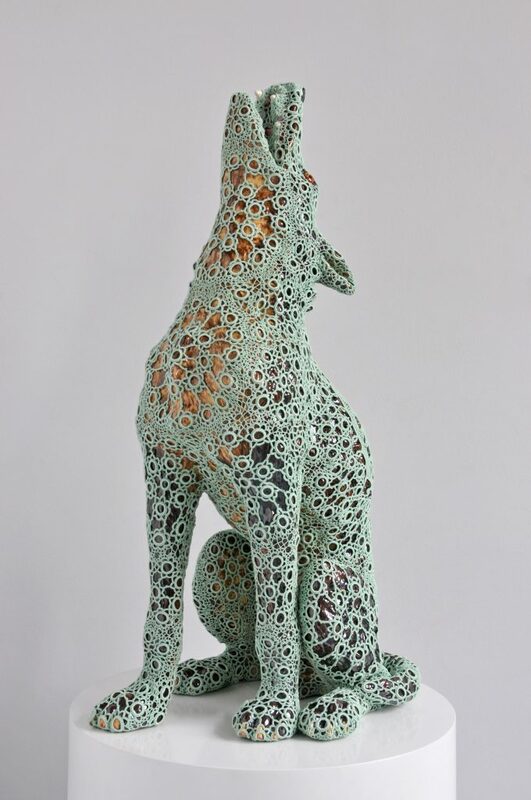 Animals and statues modestly covered in lace mantillas, awarding to their forms such familiarity, with an emphasis especially soft and delicate, sometimes troubling, but always refined. The exhibition, of which several works have been especially produced by the artist’s studio for this occasion, intentionally titled “De fil(s) en aiguille(s)”, invites the spectator to weave in and out between an octopus’s legs – larger than 25 meters – and then to confront oneself with the artwork ”Douches”, a curious assembly of textiled sculptures and mirrors. 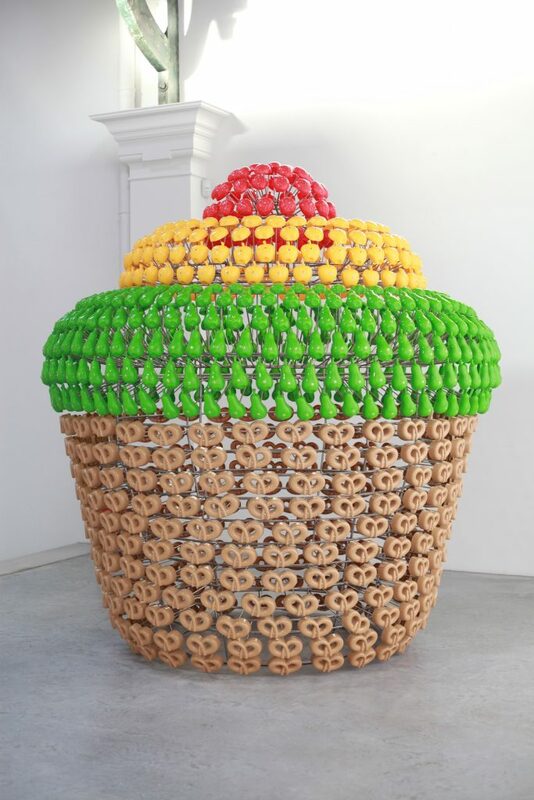 Finally, we get sucked in by a textile painting titled “Crochet Painting”, an uncontrolled crochet-work overflowing the frame and breaking off in front of the monumental sculpture “Petit Gâteau”, established with a myriad of little baking pans. An exhibition such as this one is an explosion of colours and forms, an eruption of good mood and lack of concern, inviting the spectator to a vast celebration of perception, which is as well a research about art’s vital ideas: forms, colours, lines, surface area, and texture. 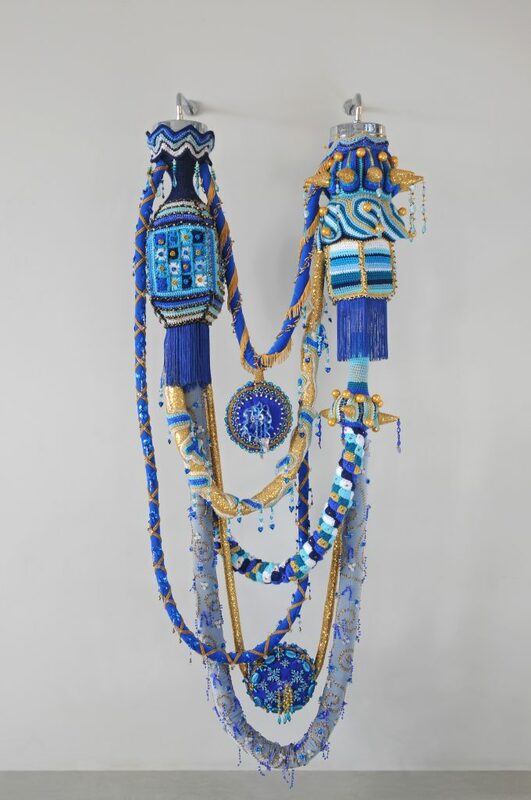 Taking the visitor into an exuberant pirouette, Joana Vasconcelos brings warmth to your heart as all the tragic creativity of a Portuguese fado does. 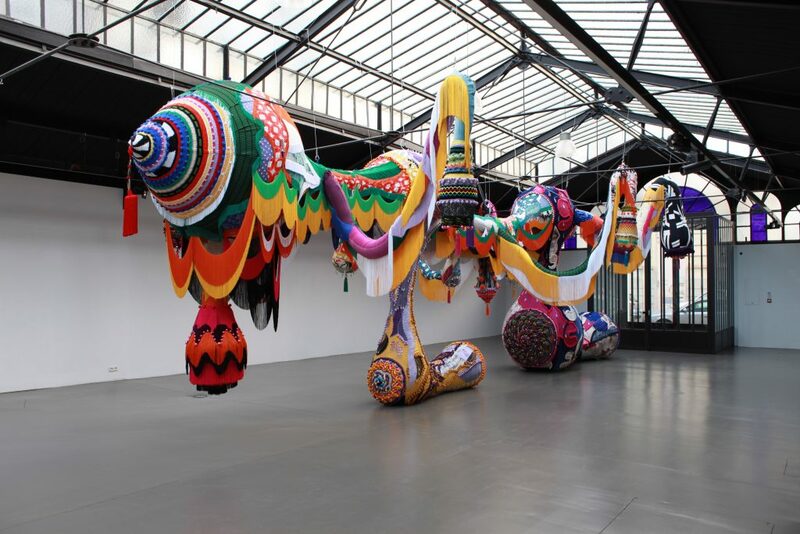 Joana Vasconcelos, Installation view, 2016. Courtesy La Patinoire Royale/ Galerie Valérie Bach. Photography: A. Greuzat.